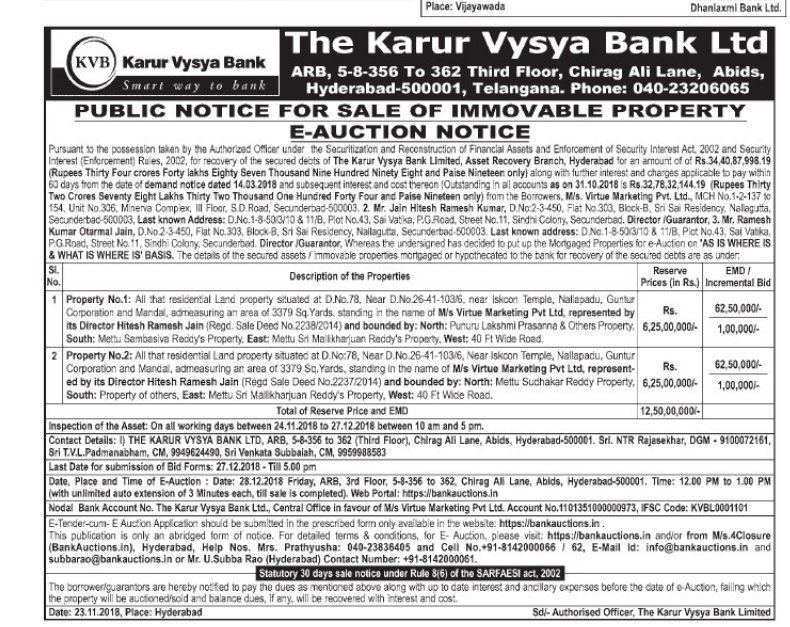 Contact Details : Contact The Authorised Officer, Karur Vysya Bank, Asset Recovery Branch, 040-23206065, Shri NTR Rajashekar, DGM, 9100072161, Sri TVL Padmanabham, CM, 9949624490, Sri Venkata Subbaiah, CM, 9959988583. Schedule of Property : Property 2) All that Residental Land property situated at D no 78 nera D No 26-41-103/6 near Iskoon temple Nalipadu Guntur Corporation and mandal admeasuring area of 3379 sq yds standing in the name of M/s virtue marketing pvt ltd Represented By its Director Hitesh Ramesh Jain (Regd SALE Deed NO 2237/2014), and Bounded by : North :Purur L;akshmi prasana & others property, South : Mettu Samba siva Reddy Property, East : Mettu Sri Malikharjuan reddy property, West :40 ft wide road. Inspection Details : For Inspection Details Please Contact The Authorised Officer, Shri NTR Rajashekar, DGM, 9100072161, Sri TVL Padmanabham, CM, 9949624490, Sri Venkata Subbaiah, CM, 9959988583, Inspection Of The Assets From 24.11.2018 To 27.12.2018 Between 10:00 AM To 05:00 PM.